I am having quite the problem... When I get to the second light ball, door to get out of the room is blocked by the twilight pillars. I am on the latest dev build and have even tried it on 4.0 and 3.5. Door is stuck closed. Are there any hiding enemies you need to beat? There are no enemies to defeat. I looked at a video walkthrough. and Zant is meant to appear, he never does. That's pretty weird. What version of OSX are you running? Is there a Windows computer you can test on? If you can upload your memory card, I'll give it a try on my end. I am on 10.10 Yosemite. Sadly no PC here. Ok, I'll check it out, and will get back to you in a bit. ALRIGHT! I fixed it! For future reference, I opened up the game in 3.5. Activated the Unlock All Portals AR code. Got to the room, saw the portal pillars falling. Saved. Quit. 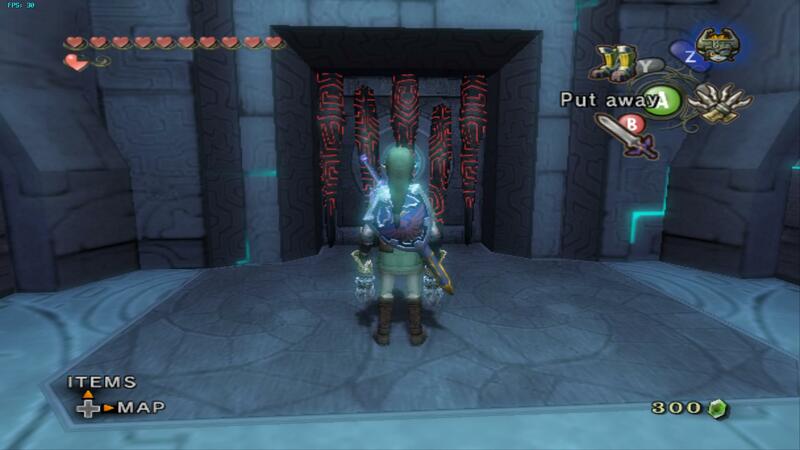 Unchecked the unlock all portals. Got to the room and Zant appeared! Thanks for getting me to think about the Game save! So, I have some bad news. I think your save is corrupted. I rebuilt your memory card with a save file that is right where you are. Let me know how it works. Well I'm glad you got the portals fixed, becasue that was the issue. (like the portals in the other room should not be there either). If your save file gets messed up again, try out mine.